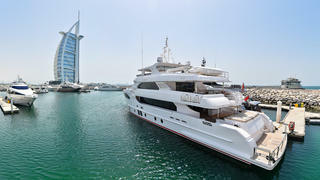 The sixth hull in the Gulf Craft Majesty 135 series has been delivered. 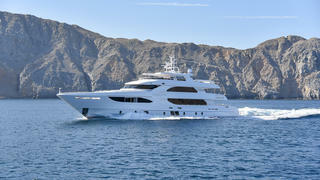 The new 41 metre semi-displacement yacht arrived to her owners earlier this month and has been named Nashwan. Styled in-house and built from GRP, the latest Majesty 135 puts a strong emphasis on maximising internal and external space as well as natural light on board. The roomy and bespoke interiors on board Nashwan have been fitted out with marble vanity tabletops and imported leathers that were specified by the owner. Her 8.14 metre beam allows for a total internal volume of 320 gross tonnes. Accommodation for up to 12 guests is split across six cabins, with the master cabin getting its own fold-out balcony, which provides the owner with exceptional views out to sea from the privacy of their own room. Nashwan can also accommodate a crew of up to ten staff. Key exterior features on board this tri-deck yacht include a dedicated beach club area in the transom and an extensive sundeck with space for storing a tender aft. 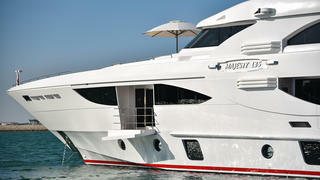 Power comes from a pair of 2,600hp MTU 16V2000 M94 diesel engines, which give Nashwan a top speed of 25 knots. Her 32,255 litre fuel tank can deliver a maximum range of 3,800 nautical miles when cruising at ten knots. News of this delivery comes just one week after Gulf Craft launched the second hull in its Majesty 122 series, the 37.5 metre Ghost II.